The ghost ball aiming system can help your whole game. One of the interesting and challenging elements we added to the World Pool Series is the use of spot shots as a tiebreaker for matches. In fact, in the first event, I lost to Lee Vann Corteza in the tiebreaker. Part of the reason I lost was that I didn�t take the time to go through the proper pre-shot routine. And part of that routine on long shots is using the ghost ball aiming technique. All pros have an aiming technique that they favor, but they really only use them a few times a match. Most of the time it�s muscle memory from having played the same shots so many times. But sometimes, particularly on long cut shots, you will see them use an aiming strategy to be sure of the contact point on the object ball. I use the ghost ball. I use the ghost ball a lot at home to practice long cut shots. That�s been one of my weaknesses, so I practice these a lot. For practice, I set up the shot as shown in the diagram. I am trying to pocket the 7 in the corner pocket from up near the break spot. I place a ghost ball (in this case the 13) in line with the 7 to the corner pocket. I leave the ghost ball in place and I practice hitting that ghost ball dead in the middle. I practice that 10 or so times, until my sight adjusts to the aiming point. Once I have the feel, I continue to shoot on that line until I can see it really well. Eventually, I can see which edge of the ball I need to hit. This drill has really helped my success on long cut shots. This is also a drill I teach my students all the time. With the ghost ball in place, their strokes loosen up because there�s no pressure. It�s a dead shot. They start to trust their stroke. Sometimes I leave the ghost ball in place while they are aiming and then pull it away when they shoot. It�s amazing how often they make it. Once I�ve taken the ghost ball away for a series of attempts, I tell them to visualize the contact point on the object ball as if the ghost ball were in place. Remember, aiming systems are fine, but you still have to execute the stroke. When my students try this shot before I employ the ghost ball, they miss most of the time. 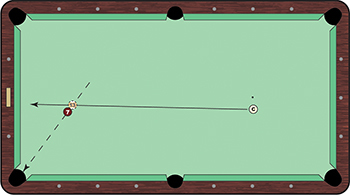 The most common problems are jumping up on the shot and unintentionally putting English on the cue ball. But once they are shooting at the ghost ball, the stroke becomes easy and free. The key to practicing these shots is to always use center cue ball. The more you work on using center cue ball, the more consistent you will be hitting the center of that ghost ball. And once you�re seeing the contact point on the intended object ball, you�ll be much more successful when the ghost ball is not there. Most of the top players focus on center cue ball. Your stroke has a better chance of holding up under pressure than when you are continually spinning the cue ball. It�s way too easy to hit the ball too thick or too thin when you�re spinning it. Obviously, in a match you can�t put a ghost ball into position to find the proper contact point on the object ball. I walk around the table and get in line with the shot and I put an imaginary ghost ball into place. That�s how I determine where the contact point is on the object ball. After that, you have to trust your stroke and aim the center of your cue ball to where the center of that ghost ball would be. Above all, commit to that contact point before you get down on your shot. That is the problem I had against Lee Vann. I didn�t use the ghost ball system on those spot shots, and I was looking for the point on the object ball after I was over the shot. That�s the exact wrong way to do it. If you are looking for the point after you get down on the shot, you�re going to be down for too long and that makes it much more difficult to execute a good stroke. One of the things I love about this drill is that you get a lot of feedback. It�s a simple system. Some other systems require you to stand in a certain place or in a certain way and aim at a certain point. I don�t believe in those. It�s too much to handle, especially in the heat of a game. This is particularly true for amateurs. Too much information is just going to cloud a player�s brain. Try this drill every day for a few weeks. First, shoot 10 times with the ghost ball in place. Then shoot 15 with the ghost ball removed. You should make 10 of the 15 shots without the ghost ball in place. And remember, use center cue ball. At the start, you may even feel like you are getting worse, but over time you will be amazed at how much this helps your whole game.